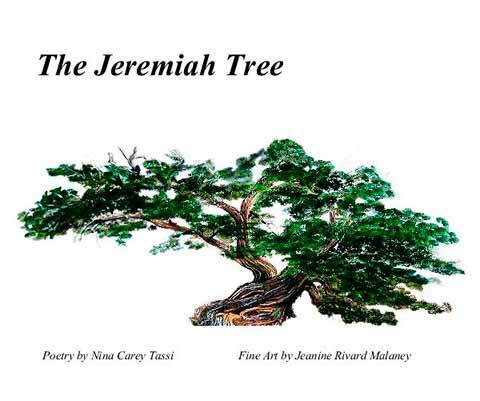 The Jeremiah Tree came about through my childhood friend, Myrna Nabors, who introduced me to her sister, painter Jeanine Malaney, and soon we found ourselves deeply engaged in a journey toward places where our spiritual lives met. Finding inspiration from each other, we traveled across the Judeo-Christian landscape. The Jeremiah Tree emerged as a dialogue: between the poems and the paintings, as one art calls out to the other for response. NT: For me, the first inspiration is often a sight that moves me. “Woman of Avila” began in St. Teresa’s native town of Avila, Spain. I was standing on the ramparts of the medieval walled town enjoying a panoramic view of the hills when I got a vivid sense of Teresa standing there as a young girl, and I wanted to capture that in words. JM: The creative process for a painting begins for me with a passion to be expressed. I work out a composition, the foundation, establishing the focal point and supporting strata to lead the eye into the painting. I plan my use of light, color and texture to best express the essence of my message. Light is the magic; I look for and enhance the play of light. Color is the music and mood. NT: I start writing words, lines as they come to me without thinking about the eventual form of the poem. But everything I write is a search for the right form—which means a marriage of sound and sense. Even if my inspiration doesn’t start with the sound of a poem—its particular music—that is very important. It’s like hunting in the dark, and suddenly the light goes on. JM: In one photo that inspired me, I liked the strong play of light and shadow on the hay bales and on the barn this fall day in Yamhill, Oregon. There are wonderful late afternoon shadows playing across the fields. The harvest golds were mesmerizing. But in the photo the eye is confused by the bales scattered about so randomly. 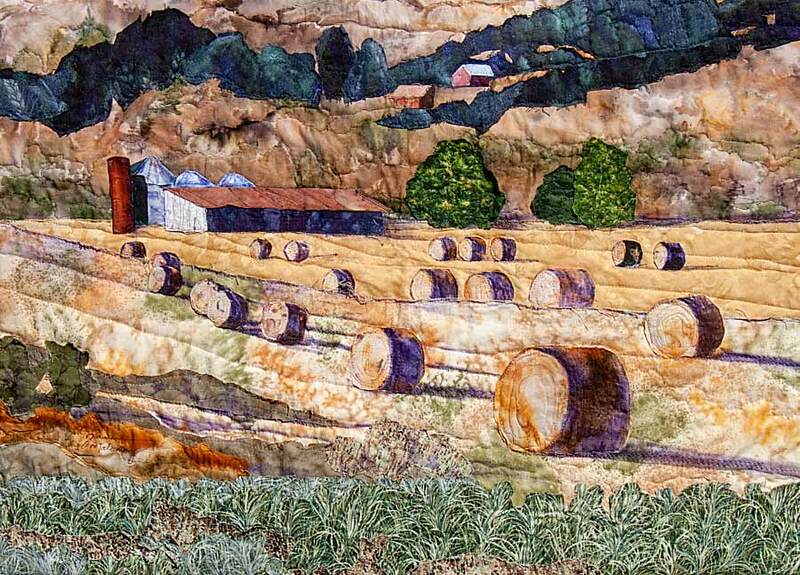 For my composition I rearranged the hay bales to lead the eye back to the focal point—the main barn and silos. I eliminated some of the buildings detracting from the focal point to simplify the composition. when you called me, Lord. drawing me near, quickening my heart. and I drew back in fear. through the air or fell to the earth. I have ever longed for. but handed down words no pillar could bear. your words craggy in my mouth. torrent of boulders, the crushing of Jerusalem. You put me through so much. Lord, for you I was a laughingstock in stocks. my bones quaked in the abode of evil ones. and would have killed me if you had let them. Your silence was the worst. straining to hear your voice. laboring to deliver your people. and withstood you for my people. What more can a son do? I asked: Are you the soul of my soul, Lord? you gave me Jesus for my brother. What a God you are! Unutterable.